LEEDS Bradford Airport was transformed into the fictional Hotten International Airport when it was used as a filming location for TV soap Emmerdale. The crew filmed outside International Arrivals and also featured Cafe Ritazza in the scenes, with shots taken featuring real life passengers and extras who passed through while filming was taking place. 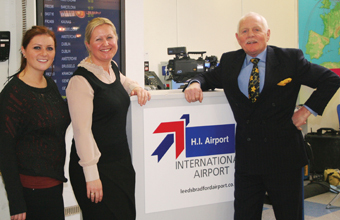 Emma Holliday of Leeds Bradford Airport said:As Yorkshire's gateway airport we were delighted to play host to Yorkshire's flagship drama series, Emmerdale, and become Hotten International for the day. Picture shows Emmerdale stars Chelsea Halfpenny and Chris Chittell on set with Leeds Bradford Airport's leisure sales executive Emma Holiday.